At 5 pm this afternoon, in the Sala Clementina of the Vatican Apostolic Palace, the Holy Father Francis received in audience the participants in the pilgrimage from Albania, who were gathered in Rome on the occasion of the 550th anniversary of the death of Giorgio Castriota Skanderbeg, Albanian national hero. I am pleased to give you my special welcome to you here on the occasion of the 550th anniversary of the death of your national hero, Giorgio Castriota Skanderbeg. I thank the Lady Ambassador for her kind words. I address a grateful greeting to those present and a thought to all the Albanians, in the homeland and in other parts of the world that, in the name of the old bond of friendship and habit of relationships, have always looked fondly at the See of Peter. And in this sense I like to remember that 50 years ago, St. Paul VI wanted to receive a representation of Albanians. Albania, a land of ancient and glorious history, is an integral part of Europe and through its noblest and most alive traditions documents the origins of its own civilization. Today we remember and celebrate Giorgio Castriota Skanderbeg, heroic son of a strong and generous people, who courageously defended the spiritual values ​​and the Christian name, to the point of deserving the title of "Athleta Christi", and forged with his deeds the Albanian cultural identity, becoming the undisputed symbol of cohesion and national unity, and interprets in the highest degree the values ​​of scrupulous loyalty to the commitments freely undertaken. The peculiar relevance of the figure and the work of the Castriota is well represented by your flag, with the double-headed eagle on a red background, which follows the hero's crest. Few times in history a single individual has incarnated so clearly and so vastly the virtues of a people, to the point that it is difficult to understand the spirit without dwelling on the principles and values ​​that animated that individual character. After the hero's death and the invasion of Albania, many Albanians preferred to emigrate and many settled in Italy, in the center of the peninsula and in the south, especially in Calabria and Sicily, giving rise to the Albanian ecclesiastical Circumscriptions of Lungro, Piana of the Albanians and Grottaferrata. The presence today at this meeting of a group of arberesh, that is the Italo-Albanians, with their traditions and linguistic expressions handed down for centuries, brings us with the imagination to the atmosphere of Albania by Skanderbeg, and confirms that the hero Albanian remains a valid bridge for the maintenance of fruitful bonds of the arberesh with their land of origin. Given the particular significance of the figure and the overall work accomplished by Giorgio Skanderbeg, it is clear that Albania wanted to proclaim the present year "National Year of Skanderbeg". I sincerely hope that this recurrence is not limited to the celebration of the glory of the past deeds, but it is also a favorable opportunity for Albania for a renewed commitment by everyone, institutions and citizens, in favor of an authentic and balanced development, so that the young generations are not placed in a position to choose emigration, weakening the country of forces and skills essential to its human and civil growth. The choral action of all in view of this goal will prove to be the best way to embody in the present time the love of Fatherland, which animated at the time Giorgio Castriota Skanderbeg. By interpreting the character and traditions of your people in the best way, he has validly expressed the albanesity, a term used by the nineteenth-century writer Pashko Vasa to indicate the spiritual identity that united all the Albanians beyond the distinctions of character religious. 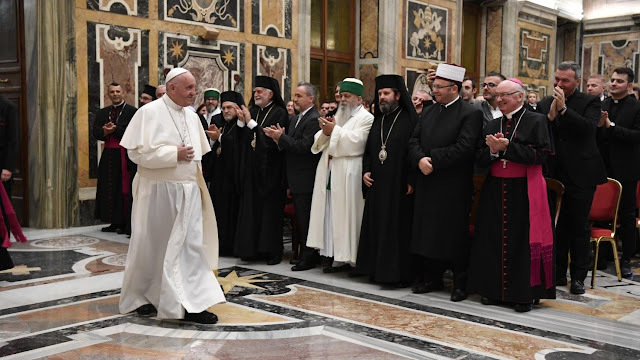 This conviction gave an impetus to Albania in the peaceful coexistence of people belonging to different religions, which over time became collaboration and fraternity. We see the example here. As I had the opportunity to say on the occasion of my visit to Albania, "the climate of respect and mutual trust between Catholics, Orthodox and Muslims is a precious asset for the country and acquires special importance in our time" (Meeting with the Authorities , 21 September 2014: Teachings II, 2 , 271). It shows that the peaceful coexistence of citizens belonging to different religions is a concretely practicable way that produces harmony and frees the best forces and creativity of an entire people, transforming simple coexistence into true collaboration and brotherhood. The good disposition to consider differences as an occasion for dialogue and mutual esteem and knowledge, also favors the development of authentic spiritual paths and becomes a valid example to which we look with real interest in building lasting peace, based on respect for the dignity of the person human. In the grateful memory of the holy martyrs who witnessed their faith to the price of life, as well as Saint Teresa of Calcutta, I am pleased to ask the Lord to bless all of you present here. God bless your family and all the Albanian people. Please do not forget to pray for me. Thank you.